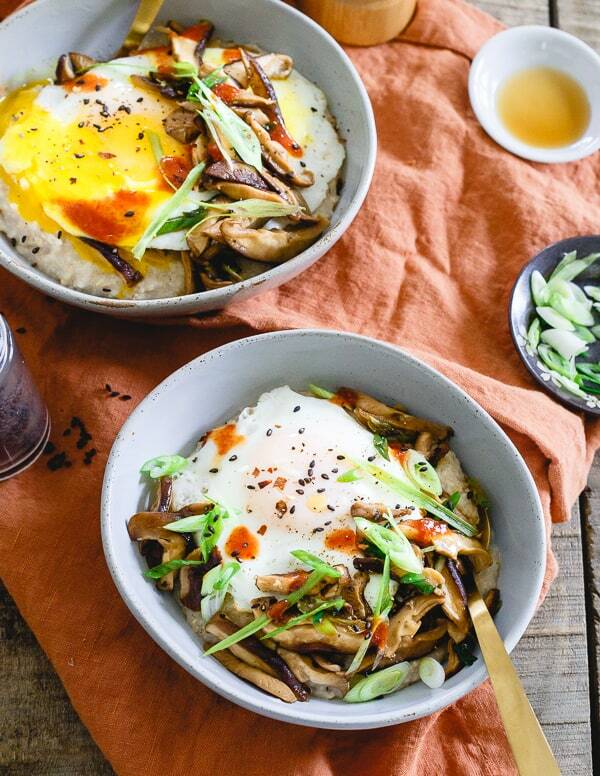 This savory Asian oat bran is simmered with spices and topped with sautéed shiitake mushrooms, fried eggs and garnished with sriracha. It’s the perfect savory breakfast twist to traditional oat bran. Plus, not only does it make a great breakfast but it’s also great for lunch or dinner! Disclosure: This post is sponsored by Healthy Aperture Blogger Network and Hodgson Mill. All opinions and thoughts are 100% my own. You all know my love/hate relationship with breakfast. I KNOW eating breakfast makes me feel better but the energy to make breakfast is usually at an all-time low in the morning. I used to think it was because I was a night owl so mornings weren’t my thing but I also just recently discovered I don’t really enjoy staying up late either. I think I’m more a mid-afternoon Martha who can rock the heck out of lunch and midday activities. However, the second the sun goes down I’m ready to get in my jammies and cover up with a big fluffy blanket. Plus, since winter refuses to go away comfort food is still at an all-time high. I mean, the snow literally refuses to go away. It’s beyond annoying. I want spring. I want windows open. I want afternoon walks where I won’t freeze my toes off. I’m teaming up with Hodgson Mill again (did you miss my other Hodgson Mill recipes? Check out my Instant Pot red wine rosemary short ribs and my hazelnut buckwheat brownies!) to showcase their oat bran. I know oat bran is typically thought of as a warm fruit topped cereal but I took that idea and threw it right out of the window. I went savory and I went Asian with my savory Asian oat bran. In fact, the Hodgson Mill oat bran was the PERFECT vehicle for all this flavor. If you’re new to oat bran I’m about to blow your mind. It cooks up in minutes (Seriously!) and you can even make a big batch and just reheat it through the week for a quick meal or snack. PLUS it’s packed full of fiber which helps you feel fuller longer which means you’re less likely to snack before lunchtime rolls around. Oh, and if all this wasn’t enough it’s packed full of soluble fiber which is the type of fiber that is linked to a decrease in blood pressure and bad cholesterol, as well as improvements in weight management, blood sugar management, and digestive health. Oat bran gets 2 thumbs up and tastes like a big warm hug. Ok, that is super cheesy BUT seriously it’s so good. Oh, and for you macro counters out there you get a pretty good carb/fat/protein ratio for a hot cereal. 100% worth it. For this recipe, I decided to really jazz up the oat bran and go a bit outside the box. 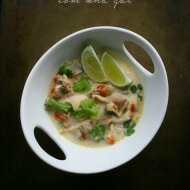 I gave it a savory flare with lots of Asian inspired flavors. 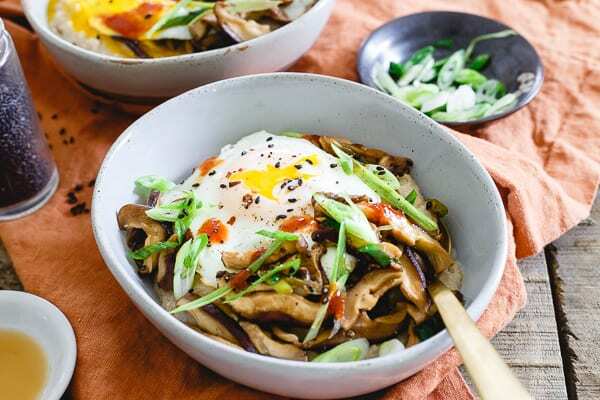 I simmered the oat bran with spices and topped it with sesame oil and soy sauce sauteed shiitake mushrooms and a perfectly fried egg. Then I garnished with all the good stuff – red pepper flakes, sesame seeds, sriracha, green onions and more sesame oil. Straight up comfort food in a bowl. Plus, as previously discussed, since winter refuses to go away it’s the perfect chilly weather breakfast. It’s comforting, easy to make and even works well for lunch and dinner. 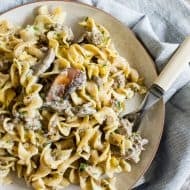 If you were looking to pack in even more protein you could easily add in Chinese sausage or saute a little ground pork with the mushrooms. 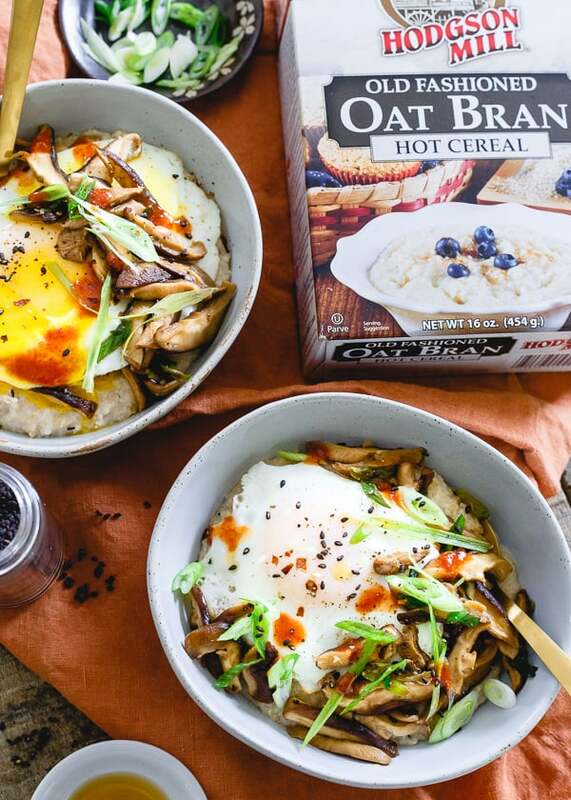 Totally digging this Savory Asian Oat Bran but still looking for even more breakfast ideas? 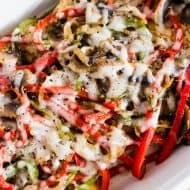 Try my garlic wild mushrooms on toast, feta chickpea shakshuka, bacon onion herb quiche, roasted apricot whole wheat farina, chorizo plantain breakfast hash, cheesy polenta sausage breakfast bowl, cheddar sausage cornmeal waffles, Huevos Motulenos, or my breakfast stuffed mushrooms. 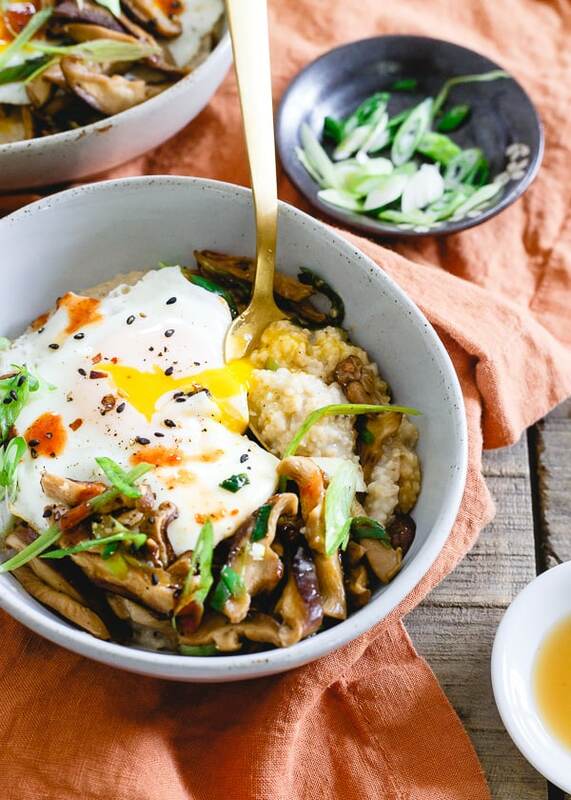 This savory Asian oat bran is simmered with spices and topped with sautéed shiitake mushrooms, fried eggs and garnished with sriracha. 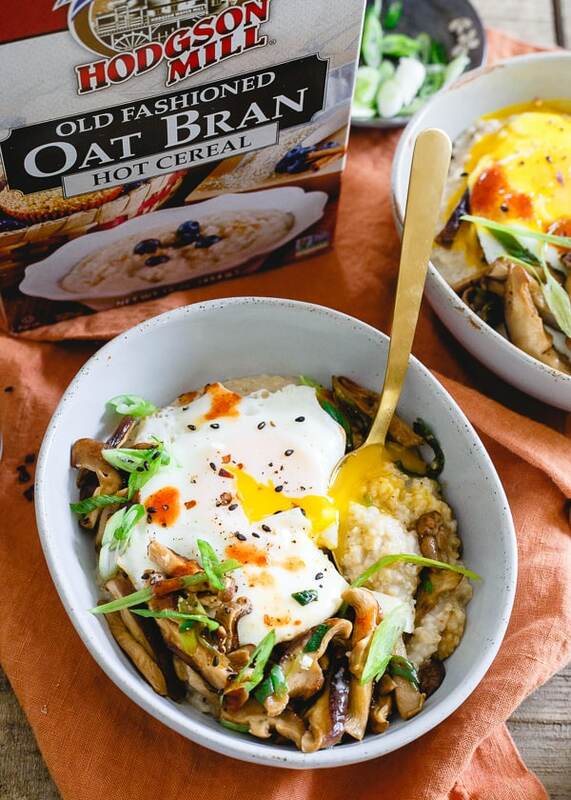 It's the perfect savory breakfast twist to traditional oat bran. Plus, not only does it make a great breakfast but it's also great for lunch or dinner! In a medium-sized saucepan add oat bran, water, milk, garlic powder, onion powder, kosher salt and black pepper. Bring to a boil over high heat, reduce heat and cook for 1-2 minutes, stirring occasionally. When fully cooked divide into 2 bowls. While the oat bran cooks, in a small skillet add sesame oil and set over medium-high heat. When the oil is hot add the shiitake mushrooms and saute for a few minutes or until the mushrooms are starting to soften. Add the green onion and soy sauce and saute for a few more minutes or until the onions are softened and the soy sauce is cooked into the mushrooms. To serve, divide the mushrooms equally between the bowls and spoon over oat bran. 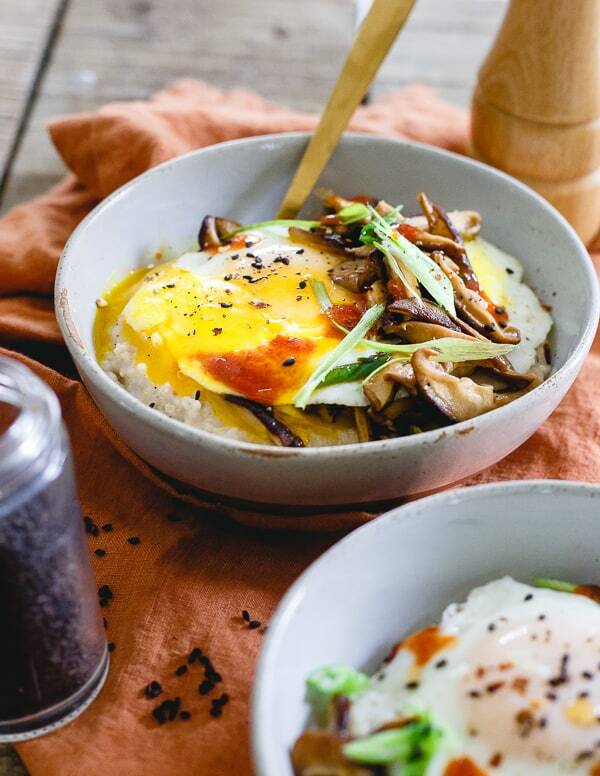 Top each bowl with a fried egg and garnish with crushed red pepper flakes, black sesame seeds, sriracha, sliced green onion and sesame oil. This looks like such a great breakfast! 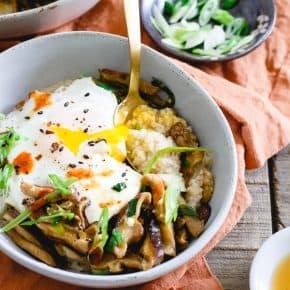 I love breakfast too, and yes especially savory ones, so much so even that I often but not always miss those ingredients at dinnertime, so thank you for putting this recipe together! This looks delicious! Definitely a great way to start the day! Oooo, ooo! This looks like something I would LOVE! It’s a nice change of pace from more traditional breakfast foods. Yum! I love all those flavors! This looks delicious! I am going to have to make this breakfast dish very soon. It looks and sounds amazing! I am going to need this breakfast dish in my life this week. It looks like a great way to start the day! I’m obsessed with this savory twist! And those mushrooms….!!! !